Exact position unknown. West or south-west of Valley Temple of Khephren. Galarza found upper part of false-door of deceased. Hassan found lower part of false-door of deceased south-east of Valley Temple of Khephren. Excavated in 1937-1938 by Hassan. Hassan, Selim. Excavations at Gîza 9: 1936-37-38. The Mastabas of the Eighth Season and their Description. Cairo: General Organisation for Government Printing Offices, 1960, pl. 39, fig. 35, p. 84 . Kamal in Ann. Serv. 9 (1908), p. 90. Porter, Bertha, and Rosalind L.B. Moss. Topographical Bibliography of Ancient Egyptian Hieroglyphic Texts, Reliefs, and Paintings 3: Memphis (Abû Rawâsh to Dahshûr). Oxford: The Clarendon Press, 1931. 2nd edition. 3: Memphis, Part 1 (Abû Rawâsh to Abûsîr), revised and augmented by Jaromír Málek. Oxford: The Clarendon Press, 1974, pp. 274-275. 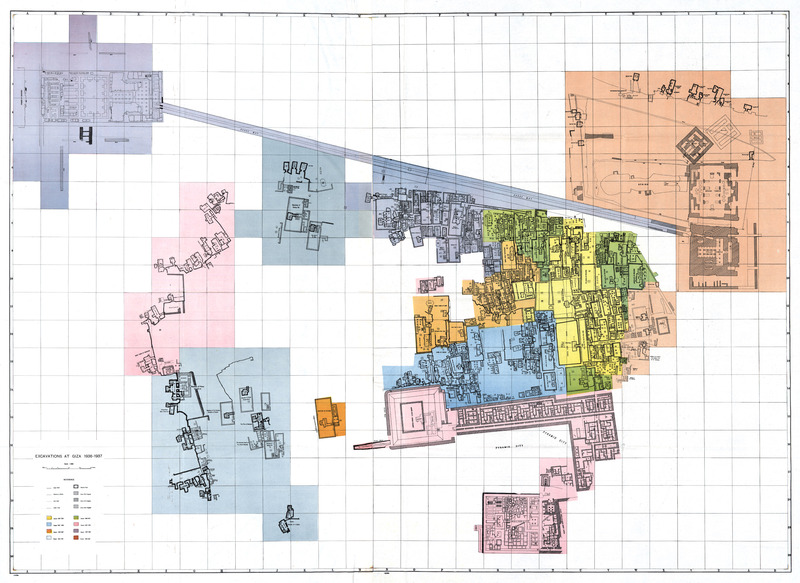 Description: General Plan of Central Field published in Selim Hassan, Giza 9; annotated with Cemetery G 8000 and G 9000 numbers. Description: General Plan of Central Field published in Selim Hassan, Giza 9.